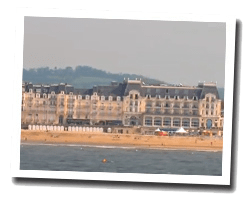 Famous Belle Epoque seaside resort, Cabourg inspired Marcel Proust. It preserves beautiful historical testimonies as the Grand Hotel. At the seaside there is a long sandy beach where racehorses are trained. It is a romantic destination, as indicated by the title of the film festival held in June. 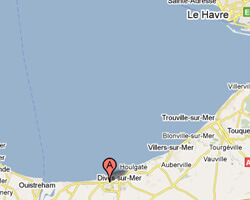 In Cabourg enjoy a seaview holiday rental. Apartment 42m2, 4th floor. Direct access to the beach. 2 rooms apartment 35 m2 (with lift) in a residence. Balcony with outdoor furniture. Nice view of the sea the sea and the beach. Direct access to the sandy beach. 2 rooms apartment 25 m2 (with lift) in a residence. Balcony. View of the sea. 2 rooms apartment 40sq. m on the ground floor, on the seafront (direct access to the beach ). Garden 10sq. m. No smoking. 2 rooms Apartment 46 m2 on the 1st floor in the "Les Terrasses du Casino residence". Balcony with outdoor furniture. Nice view of the sea and the beach. Direct access to the sandy beach. Studio flat 18sq. m with balcony facing the sea. Cottage 3 roomss. Close to the beach. terrace. Pets allowed. 4 rooms Apartment 78 m2 on 3 levels in the "Quai Sud residence". Terrace with outdoor furniture. Nice view of the port.